My youngest Hobbit Em, is quite the self taught musician. My oldest Hobbit gave her “Axle”- her treasured acoustic guitar which she never really used, and soon Em was spending hours every evening teaching herself using the internet. 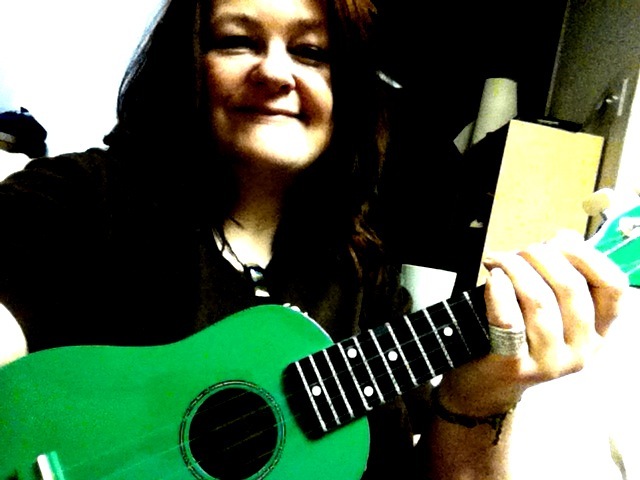 So it came as no surprise when recently she bought herself a Ukulele and took to it straight away..
She wanted me to try. Let me tell you I cannot play any instrument… it’s like knitting using needles, I just can’t do it. But Em insisted and I did want to be a good Mum and try- so I did. She taught me a few basic chords and a simple strum which I painfully got through at super slow speed. All the time I was thinking of the 1940s and George Formby and thinking it might be fun to one day serenade my food and myself with some wartime music before scoffing it down. And despite my inability to move my fingers swiftly, that first Ukulele lesson was fun and on a whim (and anyone who knows me will know that I never buy things on a whim- EVER) I found a super cheap beginners Ukulele on eBay and today it arrived. Brilliant..i can join in the chorus on the spoons or washboard if you like!…have fun! Oh, such fun, I loved it ! George Formby is buried in my home town’s main cemetry (Warrington). Good luck with that. I’m glad you have the packing to do and so won’t be able to overdo it: adults taking up new instruments can sometimes suffer from RSI if they practise too much. That happened to my mother when she took up the guitar after us kids were off her hands. Just found your website a few days ago when I was doing some research to try a one week wartime diet for myself. What an amazing site this is, Carolyn. So much information, humour and warmth. Fantastic job. I just want to say thank you for your blog. I cannot begin to say how you have inspired me in so many ways. I am 27 years old and an unemployed single mother who is also trying to lose weight and save money. I felt so ashamed when my local doctors surgery told me I needed to lose weight as I am overweight. Add to that the frustration at struggling to be able to gain employment and it can be easy to get de-motivated but reading your blog and writing my own helps me to stay on track. Of course my grandmother having been a land girl and my grandfather a farmer during WW11 is a big influence on me and I hope to understand more about what they must have gone through. I was interested to read about you growing your hair out as that is what I am doing at present (four weeks so far) as I have never liked my natural blonde hair but being happy with who I am is a part of this challenge and so I am not going to hide behind hair dye anymore. I am very grateful this blog exists.